I finally got around to trying Excuse Moi! 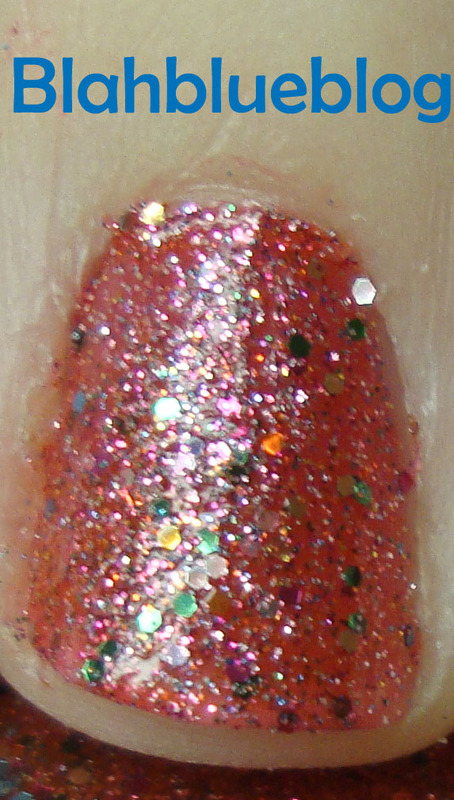 from OPI’s Muppets holiday collection for 2011. I only bought 3 glitter colors from the collection Excuse Moi!, Gone Gonzo! (review here), and Divine Swine (which looks very similar to Gone Gonzo!). Excuse Moi! contains medium round rainbow glitter with silver microglitter suspended in a dark pink base. 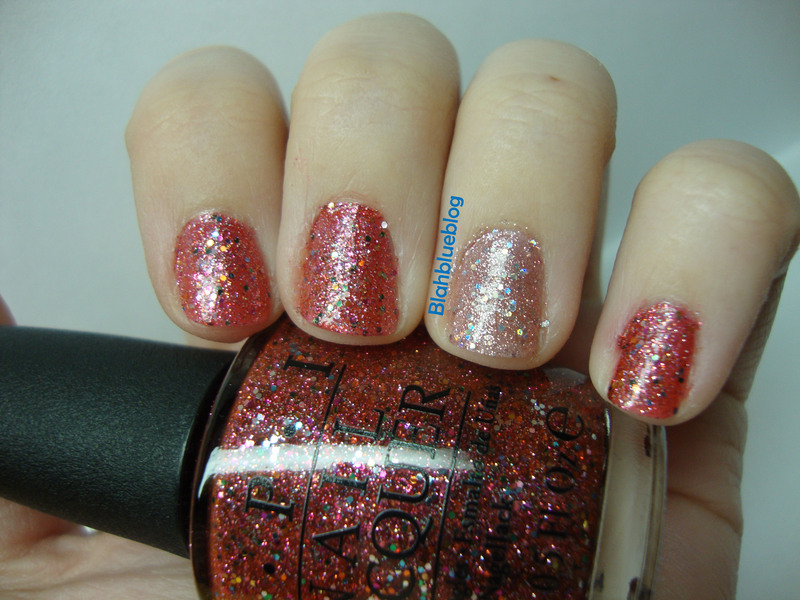 It may easily be one of my new favorites, it reminds me of OPI’s Teenage Dream from the Katy Perry Collection (reviewed here) except the pink base is darker and the larger glitter is many different rainbow colors instead of silver holographic glitter. Excuse Moi! goes on a little thick but dries very quickly. It has slightly rough texture that is hard to smooth out even with several coats of OPI’s Rapid Dry Top Coat, but lasts for days with only minimal tip wear. It is nearly opaque in 1 coat but I used 2 coats for pictures. I have Excuse Moi! on all fingers except my ring finger which has two coats of OPI’s Teenage Dream. 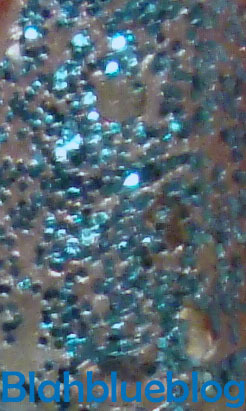 In the close up below you can see the densely packed silver glitter and scattered medium sized rainbow glitter. I highly recommend picking up Excuse Moi! because it is opaque in two coats, dries quickly, and lasts with minimal wear for well over 5 days. I finally got around to trying one of my Muppets Collection Nail Polishes. I only bought 3 glitter colors from the collection, Gone Gonzo!, Divine Swine, and Excuse Moi! Overall many of the non glitters from this collection are similar to other colors that I already own so I was able to practice some self-control and only buy the polishes that I could not live without. Gone Gonzo! 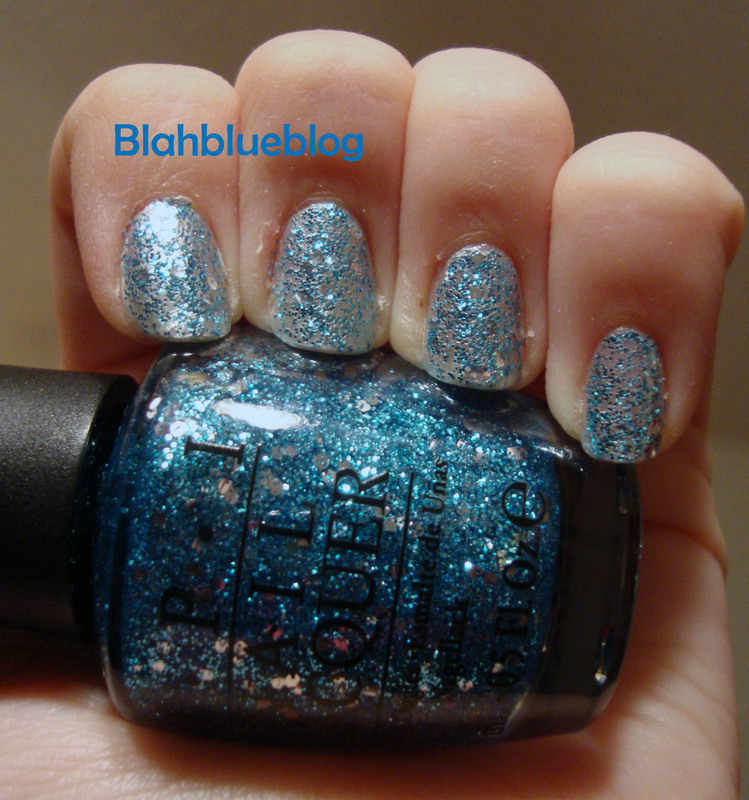 is a clear nail polish glitter packed with large hexagon silver glitter and smaller turquoise glitters. I achieved great coverage in 2 to 3 coats. In my photos I layered 2 coats of Gone Gonzo! over one coat of China Glaze Platinum Silver to highlight the silver hexagon glitters.